After he retired from teaching English in 1989, Peter Rolfe ran a micro-business called Brookwater Aquatics for seven years. He and a friend cultivated water plants, bred fish and advised on the creation and management of ponds and lakes. He now looks after a series of six ponds as a nature reserve, where he experiments with raising crucians and finding out the best fish to accompany them. He also runs a fishery of two small estate lakes, containing no carp, just crucians, tench, roach and perch – old-fashioned fishing! Over the years he has created or restored nearly fifty ponds and lakes, the story of some of which is told in his first book, Net on the Garage Wall, published by Medlar in 1997. 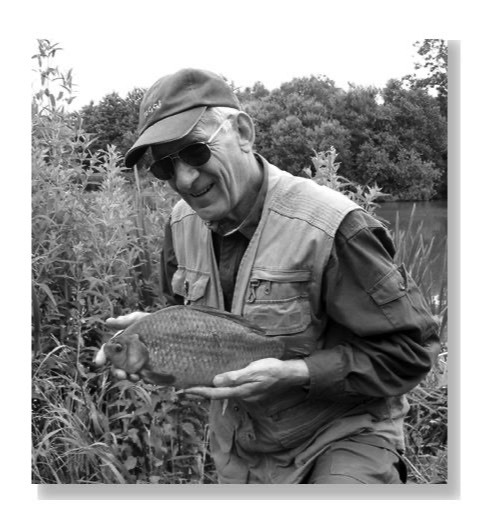 Since then he has written the 'crucian bible', Crock of Gold, Seeking the Crucian Carp (2010) and an account of restoring, stocking, managing and fishing a Victorian estate lake, Reflections on Still Water (2015). His biggest crucian landed on rod and line is 3lb 10oz - but he is just as happy to catch small fish. For his work on the species he won the Angling Trust Fred J Taylor Award for Environmental Stewardship in the World of Angling and he sits on the committee of the National Crucian Conservation Project. He spends more time pottering and pondering by water than actually fishing, likes to take his time over coppicing and pollarding willows and still uses a scythe to cut grass rather than a strimmer, so he can hear the birds singing! He enjoys the atmosphere and wildlife of his ponds and lakes, and chatting with the small number of fishermen lucky enough to have one of the limited season tickets. Opera, serious music and reading are amongst his other interests, and he runs groups in writing and literature for the local branch of the University of the Third Age.